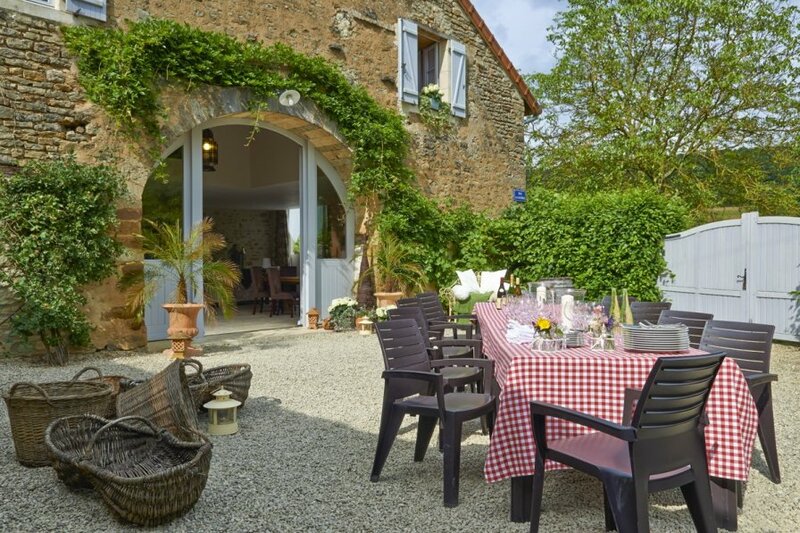 Dating back to the 17th Century, this historical farmhouse used to be part of a nearby Chateau, yet it has now been transformed into an elegant and welcoming holiday home. Enter through the magnificent oak doors, designed by the owner and made by local artisans, into the vast living and dining space. Full of warmth and light, the traditional flag stone floors and a cast-iron wood burner perfectly complement the sumptuous velvet sofas and contemporary open-plan kitchen with its duo wine-cellar. Dine around the huge oak table, created by the owner and her carpenter, the perfect place to enjoy amazing feasts with loved ones. She also has exclusive access to some of the finest vineyards in Burgundy, not only in the surrounding Cote D'Or region but also as far north as Chablis, Irancy, Coulanges Le Vineuse and Saint. Bris and south to Cote de Nuits and Beaune. Whether it's a private tour, exquisite lunch or home-made picnic in the vineyards, the owner can arrange a unique wine-tasting experience like no other. It's just a short stroll down the lane by the stream to the charming local village with its bakery and little bistro. Hire bikes from La Ferme Gourmande and cycle along the beautiful Burgundy canal or take in the landscapes of woods, valleys and vineyards around you. The more adventurous can head to the Parc Naturel Regional du Morvan for mountain biking, hiking and watersports on the river and lakes whilst golf lovers must experience the prestigious course with lunch at Chateau de Chailly. La Ferme Gourmande is located in a village in the Cote D'Or wine region of Burgundy. Within a two-minute stroll you can be walking around the moat and woods surrounding a privately owned 13th century castle. The heart of the local village (500m) has a bakery and a local bistro serving drinks, salads, snacks and ice-cream in a pretty little garden. There's also the beautiful Burgundy canal, perfect for leisurely walks or cycling; the owner has bikes that you can hire. Here you are in the heart of hidden Burgundy with a wealth of activities and places to visit on your doorstep. In this stunning Cote D'Or region, so well known for its remarkable wines, the owner has exclusive access to many of the finest vineyards and can arrange personal tours, wine tastings with lunch or picnics in the vineyards for wonderful days out. For a change of scene you can head west to visit the historic town of Saulieu with many internationally renowned restaurants. This is the gateway to the Parc Naturel Regional du Morvan where you will find beautiful woodlands, streams and waterfalls, gentle rolling hills and hidden villages. Wonderful for hikers and cyclists or you may prefer to canoe down the Yonne River, sail or kayak on one of the lakes or go horse riding through the spectacular scenery. Golf-lovers will also be impressed with stunning courses throughout the region including the prestigious course at the Chateau de Chailly which can be combined with an exquisite meal in the hotel's restaurant. As well as all the outdoor activities on offer, kids will also love the nearby Museo Parc Alesia (10km), a huge park that tells the story of the ancient city Alesia, it's battle and the fate of the town through tours, museum exhibitions, archaeological sites and historical re-enactments. There's also an exhibition featuring the world's most famous Gaul, Asterix.